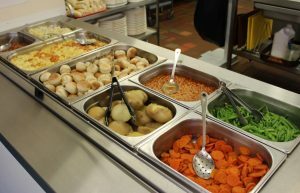 Healthy, nutritious cooked school meals are freshly prepared on site by our caterers, Hertfordshire Catering Ltd, following the multi choice menu. Children may choose from a variety of main courses, vegetables and desserts where there is an emphasis on a healthy diet and whole foods are used wherever possible. Fresh fruit and drinks are available every day. Universal free school meals are available for children in Reception, Year 1 and Year 2. 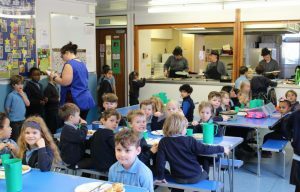 For Nursery and KS2 school pupils dinners currently cost £2.60 per day (£2.30 per day for Nursery) and parents will be invoiced for meals half termly in advance. 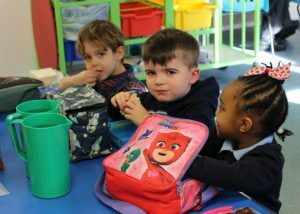 Children eat together in the dining area supervised by our midday staff who are responsible to the Head Teacher for pupils’ welfare. Alternatively, children may bring a packed lunch from home. You also have the option of choosing a combination of both school dinners and packed lunches e.g. you may want school dinners on a Wed and Fri, and packed lunches for the other 3 days, etc. You will need to commit to a pattern for half a term and pay in advance, giving the office two weeks’ notice if you wish to change from one arrangement to another. All pupils in Foundation Stage and KS1 are entitled to one piece of fruit or vegetable per day, provided by the government, and children whose parents purchase milk through the school can drink it at this time. KS2 pupils are very welcome to bring in a snack from home for morning break but this must be fruit or vegetables only – no snack bars are allowed. Eating well is extremely important for children as it gives them energy and provides them with the nutrients they need to grow, develop and be healthy and active. We encourage parents to provide as healthy a packed lunch as possible. Below is an information leaflet on healthy packed lunches, which we encourage you to take the time to read. We hope you will find some useful tips on providing a healthy and varied lunch for your child. We have an increased number of pupils at school with severe allergies. Please note that food containing nuts must not be brought into school. This applies to packed lunches and break time snacks and includes peanut butter and Nutella sandwiches. Thank you for your co-operation.